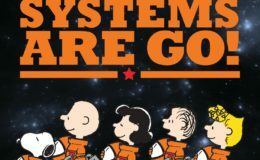 Discover how cartoonist Charles M. Schulz partnered with NASA to bring everyone’s favorite beagle Snoopy to the moon in this retrospective panel about the history and future of Snoopy in space. The panel will feature talking heads from the Schulz Museum, Schulz Studio, NASA, and beyond! Moderated by Damian Holbrook and and featuring panelists Stephanie Betts (SVP of development and current series DHX), Aimee Crane (NASA consultant), Lex Fajardo (Charles M. Schulz creative associates), Rachel Fellman (Charles M. Schulz Museum archivist), Ginger Kerrick (NASA flight director), and Robert Pearlman (editor of CollectSPACE). I’m not on this panel, of course, but am I going to be at this panel? I’m sure going to try!